The creators of the new musical version of Made in Dagenham say they are confident the show won't join the list of recent West End casualties. The show, about women who battled for equal rights at a Ford factory in Essex in 1968, is based on the 2010 film. 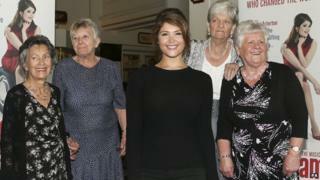 It stars Gemma Arterton in the lead role of factory worker Rita O'Grady. The former Bond girl admitted the early closure of shows like I Can't Sing! made her "nervous" but she hoped the musical would buck the trend. Inspired by the X Factor, Harry Hill's I Can't Sing! lasted just two months in the West End; Andrew Lloyd Webber's 1960s-set musical Stephen Ward made it to four; and the curtain came down on Sir Tim Rice's From Here to Eternity after six months. Even The Full Monty, which had rave reviews when it opened in Sheffield last year, closed after five weeks in London. "We know that the British musical is in a challenged position at the moment," said Made In Dagenham's director Rupert Goold. "We do have a tradition from Lionel Bart onwards of a particular kind of musical theatre. "We have the best comic playwrights in the world and the best songwriters, so there's absolutely no reason why we shouldn't have the best musical. I hope Made in Dagenham is part of that tradition - and the beginning of something new." Arterton, who is signed up to star for six months, said: "Obviously I'm nervous about it but all we can do is make sure our show is special." She and other cast members previewed five songs from Made In Dagenham at a special performance in London on Tuesday. Better known for her dramatic roles, the actress said she would be "absolutely petrified" about singing on stage when the show begins previews at the Adelphi Theatre in October. The musical is written by Richard Bean, with music by David Arnold and lyrics by Richard Thomas, who wrote Jerry Springer: The Opera. Bean, who had a West End hit with farce One Man, Two Guvnors, said: "If you set out to set out to write a hit you're not going to write a hit. You're going to write something that's trying to be a hit. "You've got to get the art right and if you do then everything else will follow." Thomas told BBC News: "I Cant Sing! was a hilarious show. You see what happened and a chill runs up your spine. What are you going to do? We are giving it our best shot." James Bond film composer Arnold said he had seen many of the shows that had closed and was "baffled" by their failure. He said Made in Dagenham was "a show with great heart". "It's about something important but is told in a way that's hugely entertaining. I hope that's a message that people will find out for themselves." Theatre critic Mark Shenton said there was room for an "authentic British musical" and that Dagenham fitted the bill. "Everybody is hoping to create the next Phantom or Billy Elliot, and I think this one has a better chance than most," he said.